SpaCy 2.03 has 219 words in that list. MIT-licensed “stopwords-iso” has a list of 170 words (October 2016 version). They are available from the GitHub repo at https://github.com/stopwords-iso. The Snowball stemmer has 94 words at http://snowball.tartarus.org/algorithms/danish/stop.txt. A search with an Internet search engine on “Danish stopwords” reveals several other pointers to lists. This entry was posted in Python, technical and tagged danish, stopwords, text mining. A citation property has just be created a few hours ago, – and as of writing still not been deleted. It means we can describe citation network, e.g., among scientific papers. So far we have added a few citations, – mostly from papers about Zika. And now we can plot the citation network or compute the network measures such as page rank. This entry was posted in Python, science, technical and tagged citations, Wikidata. I may have managed to setup a virtual machine with Vagrant, partially following instructions from the vagrant homepage. * The box 'hashicorp/precise32' could not be found. Somewhere inbetween I erased old Virtualbox files in “VirtualBox VMs” directory: “rm -r test_1406195091/” and “rm -r pythoner/”. This entry was posted in Python, technical and tagged python, Vagrant, virtual machine. I.e., no name and it continues to show ‘Searching for devices…’ with the ‘continue’ button disabled. The ‘Bluetooth New Device Setup’ now manages to get through: It claims that “Paired” is “Yes”, but “Type” is still “Unknown”. The address is set correctly. oscdump does not directly work due to Matt hard-coding a directory name. But still no apparently data in MuseLab. muse-player does not work out of the box. Moving the libraries provided by the SDK and trying again. The bad news is that muse-io requires 32-bit version of libliblo while my muse-player through Python requires 64-bit. The solution seems to be to move muse-io to a directory independent of the Python files and in that directly also put the SDK-provided liblo library files. This entry was posted in Python, technical and tagged Muse, OSC. There are various ways of plotting the distribution of highly skewed (heavy-tailed) data, e.g., with a histogram with logarithmically-spaced bins on a log-log plot, or by generating a Zipf-like plot (rank-frequency plot) like the above. 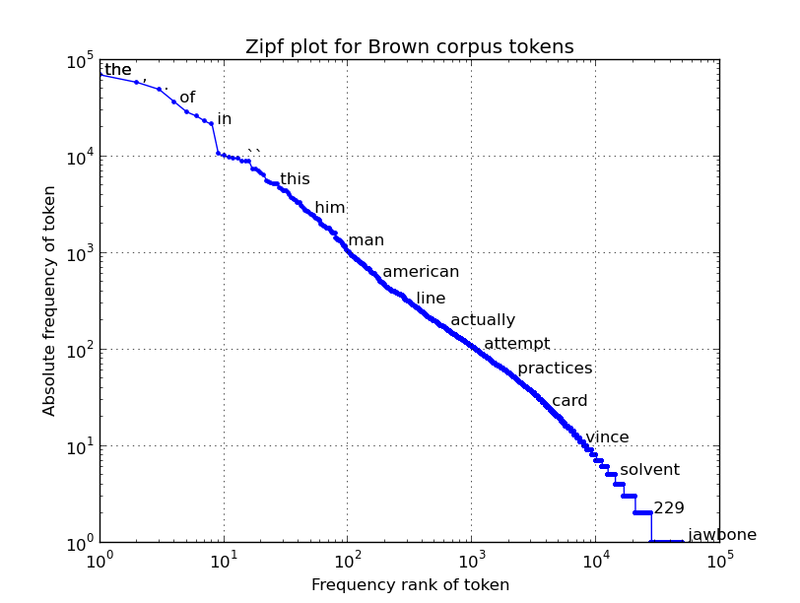 This figure uses token count data from the Brown corpus as made available in the NLTK package. For fitting the Zipf-curve a simple Scipy-based approach is suggested on Stackoverflow by “Evert”. More complicated power-law fitting is implemented on the Python package powerlaw described in Powerlaw: a Python package for analysis of heavy-tailed distributions that is based on the Clauset-paper. This entry was posted in programming, Python, science and tagged Brown corpus, heavy-tailed distributions, log-log plot, nltk, python, Zipf.